I was using my NYX Green Tea remover for long, and when it got over, I got three bi-phase removers. Why I prefer Bi-Phase Removers? Because they are lot easier and far more effective than any makeup removers that I have used. The creamy ones hardly worked for me and always stung my eyes. 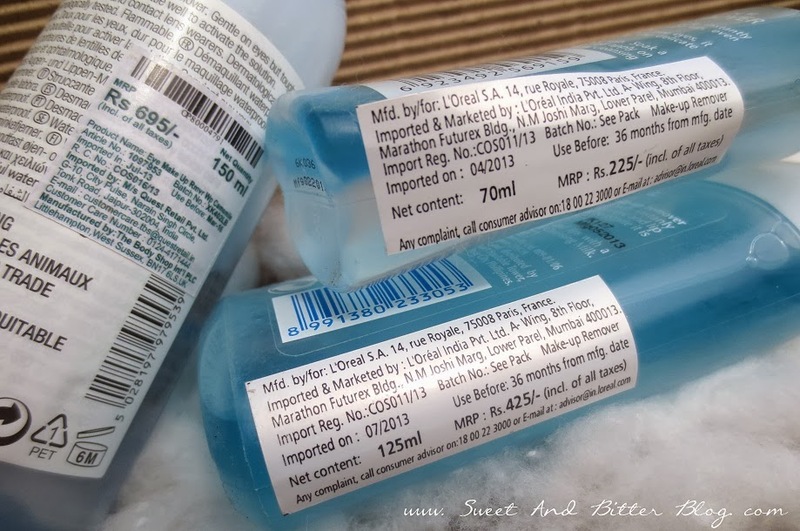 The oil cleansers available in India are all mineral oil based and hurt eyes and make them cloudy. 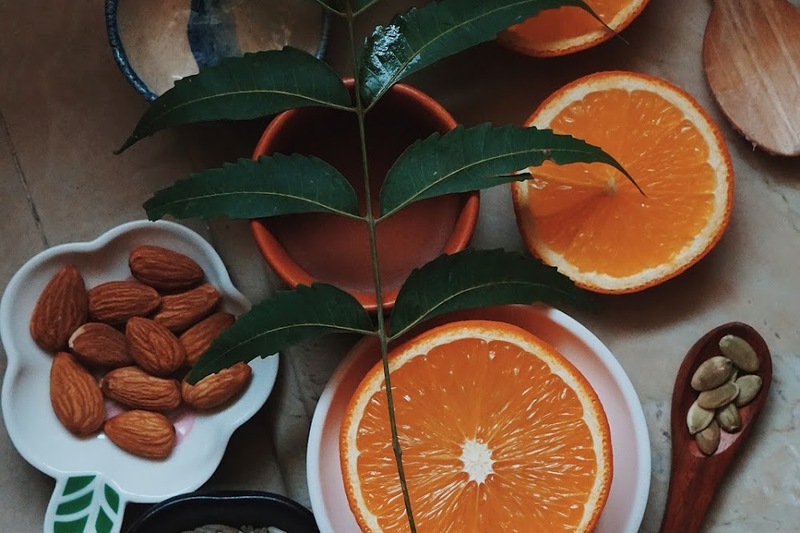 Why are Bi-Phase Removers good for you? 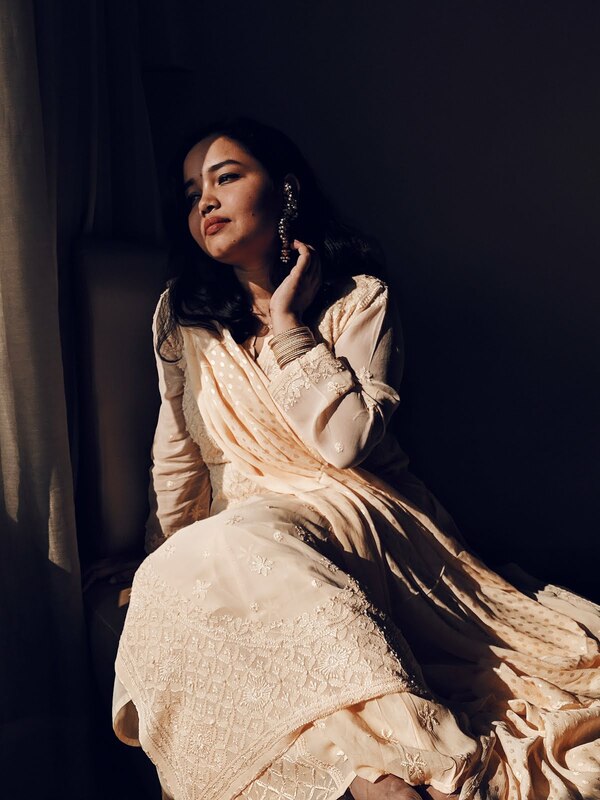 I remember that once a girl asked the SA asked at the counter - "Can I get a kajal that stays on all day but easy to remove? I have to set a war to remove with Maybelline Colossal one." And that set me thinking, isn't that the point? It should be easy to remove; otherwise, it will just smudge! And no matter how tough it is to remove the eye makeup, never start a war. When you are young, you will not know the difference. 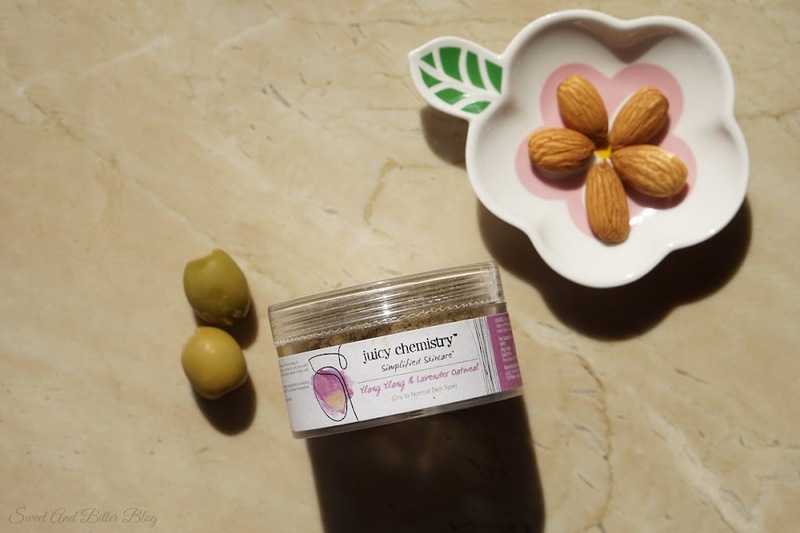 But, as you tug and stretch your skin, you are inviting fine lines and wrinkles sooner. And once they come, they won't go. The only possible thing is to make sure to use an eye makeup remover that is gentle and take off your makeup in one gentle swipe. 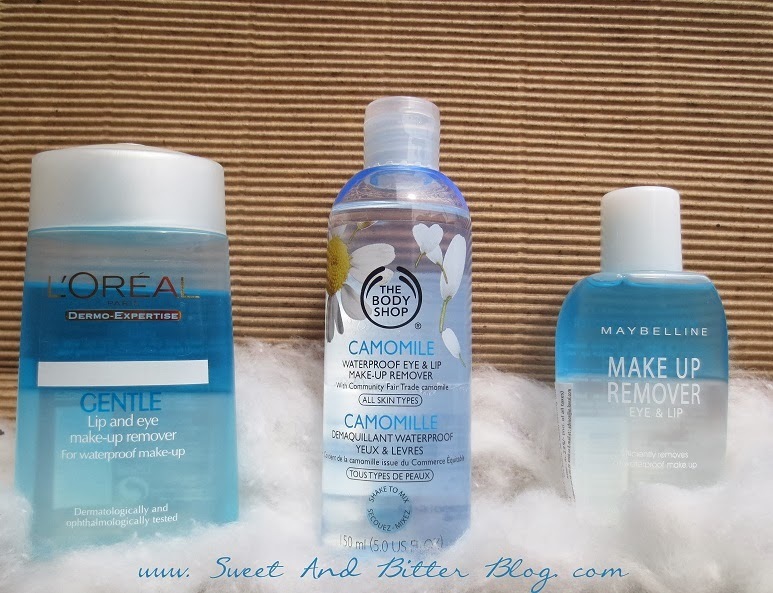 The newly launched The Body Shop Camomile Waterproof Eye and Lip Makeup Remover for All Skin Types. So, instead of going for a separate review, I decide on a quick comparative post. 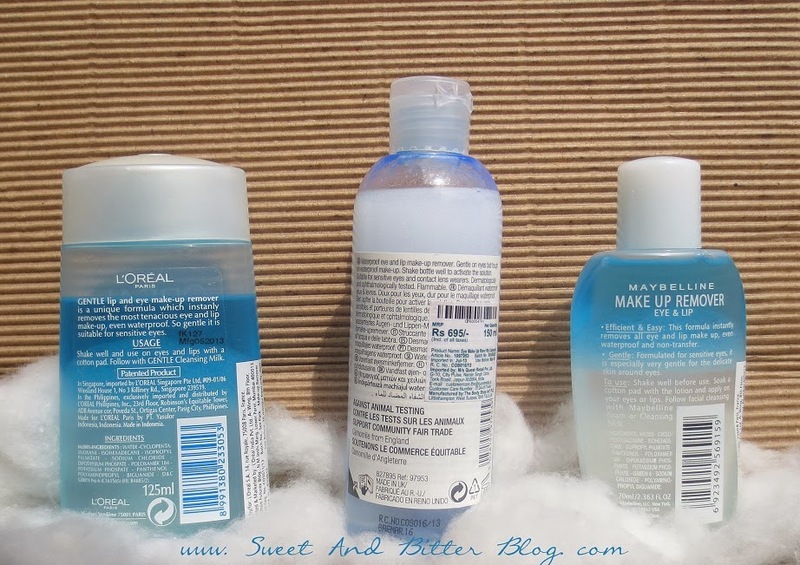 Bi-phase removers have part oil and part watery to remove waterproof makeup. 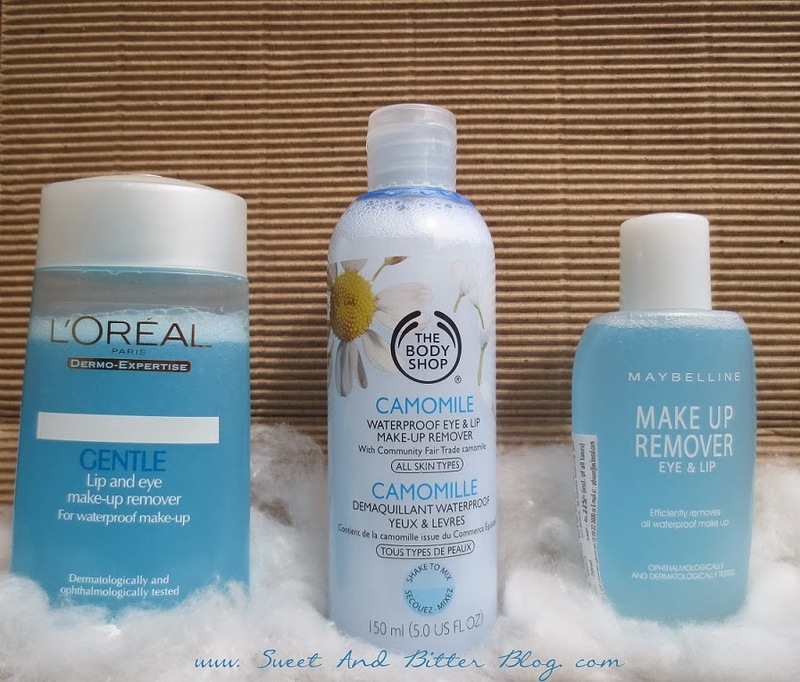 L'Oreal and Maybelline have the oily part colored blue, but the oil part in The Body Shop Camomile is transparent. 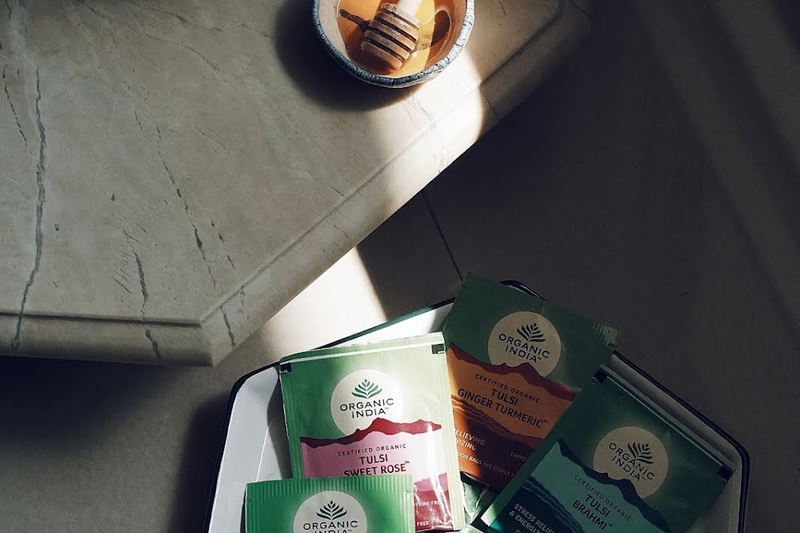 Look carefully at the below image and you will see a separating line the text 'With Community Fair Trade Camomile' for The Body Shop. Shake it Baby! You have to shake the bottle to make sure that both parts mix. Shake the Bi-phase remover and here is how they look after shaking. 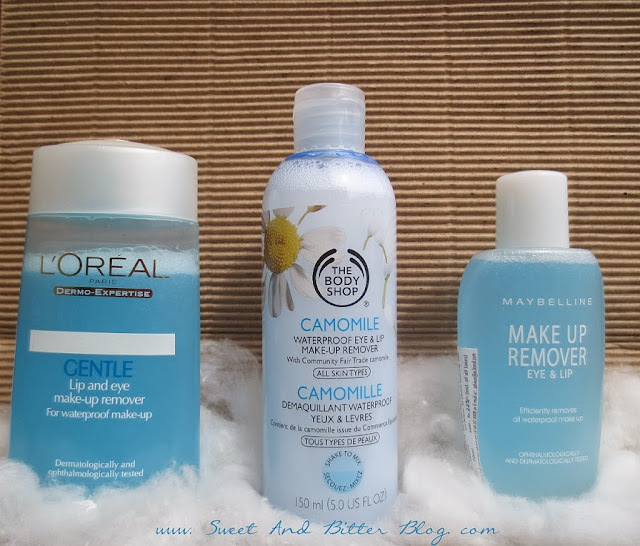 L'Oreal and Maybelline separate in seconds, but The Body Shop Camomile takes some time to separate. The Press and Glide. Take cotton wool and wet it using remover after shaking them. Lightly press the cotton over your eyes for 3-5 secs. Slowly glide away the cotton wool to remove the makeup. If you dab for longer, then you might not have to glide as well! 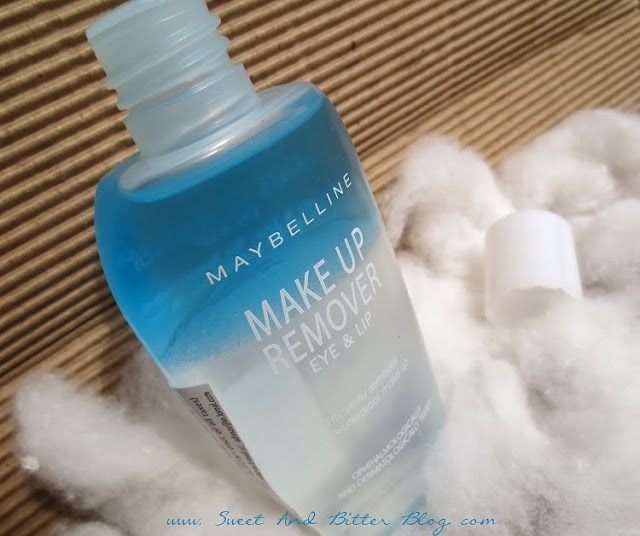 First up is the old and trusted remover from Maybelline. This is the first one to come to India and I certainly never have any complaints against it. Initially, it used to come in two sizes but now only one is available. Some complain that it gets a bit oily, but I face that issue when I have not mixed the two layers properly. The price sounds pocket-friendly compared to others, but I have a disclosure at the end of the post. 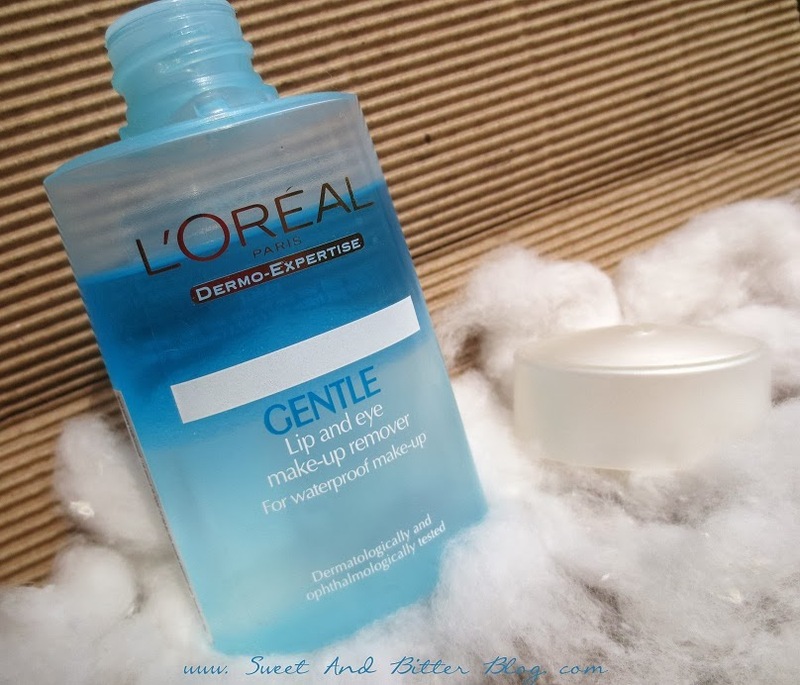 L'Oreal makeup remover is gentle and takes more time to remove makeup compare to Maybelline. The composition seems like same as Maybelline packed in a different bottle. But, I have a small issue with this. Maybe because I have to swipe thrice or more to take off my makeup, I always see one or two eyelashes on the cotton ball. This is scary because God has not gifted me many eyelashes to waste one every time I remove mascara! So, I have reserved this only for removing foundation, blush, and lipstick. 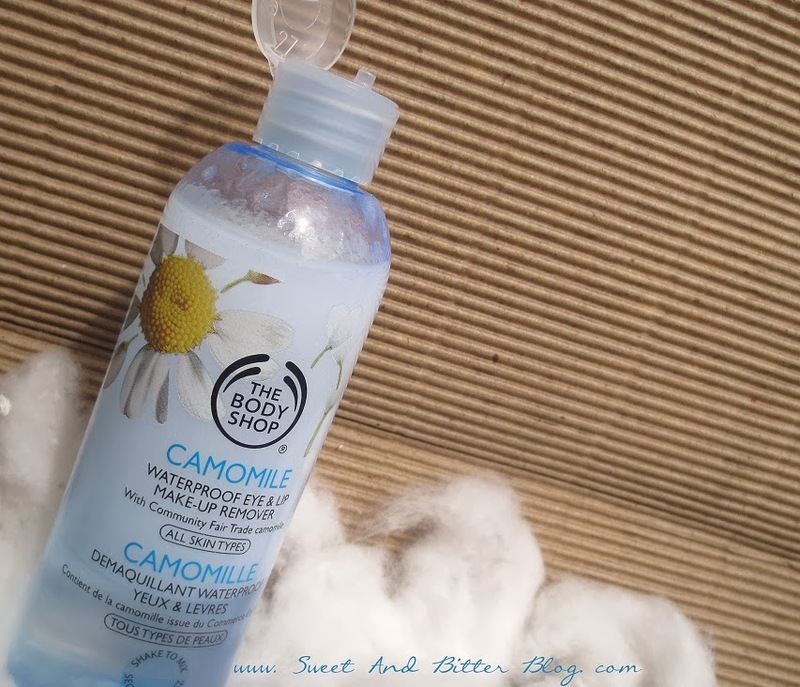 The Body Shop Camomile Waterproof remover is a new launch. The Body Shop already had a camomile remover that has SLS, but this is a new launch. They also have butter from the same range to remove makeup that I wanted to buy, but the price put me off. So, I ended up with this. The Body Shop Waterproof Remover takes the maximum time to separate so, in case you need it again, you do not have to shake it. It works just like the Maybelline waterproof remover and does not harm my lashes like L'Oreal gentle makeup remover. So, thought the price of L'Oreal looks more than Maybelline but as you can see that the price difference is not much. Even the one from The Body Shop is not that highly priced as it sounds because you are getting more in the bottle and there are always some offers in The Body Shop. Practically, they are all of the similar prices! Rating: Maybelline comes first because you do not have a put in a huge amount in one go, and it works perfectly. The Body Shop Camomile is also efficient. Plus, you do not get the heavy, oily feel after use. The last will sadly be L'Oreal because somehow it caused my eyelashes to shred. I will try some day again to see if the issue continues.